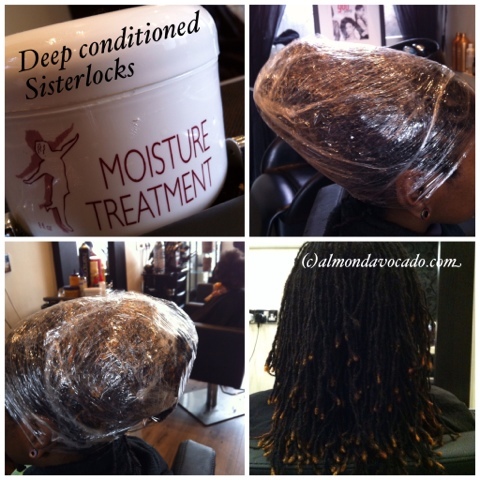 Deep conditioning a client's Sisterlocks at the Hair Boutique in London. 2. Shampooed hair with Sisterlocks Salon Shampoo. 3. Gave client a gentle scalp massage to stimulate circulation and soothe the nerves. 4. Rinsed thoroughly & squeezed excess water from the locs. 5. Sectioned hair and applied treatment throughout the length of the locs, concentrating on the ends. 6. Wrapped hair and applied heat for 20 mins (under a hooded dryer). 7. Rinsed product (although the instructions say you could leave it in if you prefer) and dried hair. 8. Retightened all her beautiful locs. Has anyone else tried deep conditioning with the Sisterlocks Moisture Treatment?